We recommend to use JR train to get to Tokyo from Narita. The route is as follows. Narita Airport Sta. --( JR Limited Express "NEX")--> Shinagawa Sta. --( JR Limited Express "NEX")--> Shinjuku Sta. 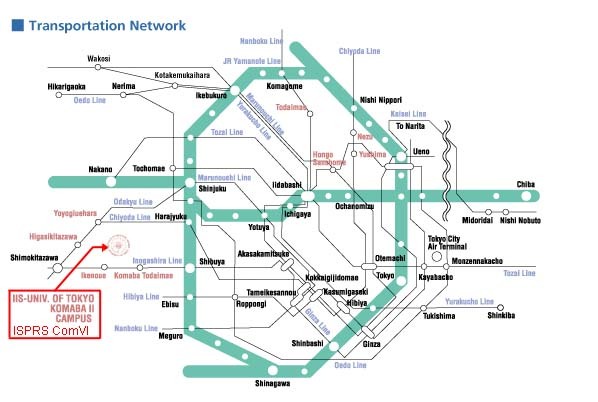 * If you are going to Shinjuku, you don't have to get off at Shinagawa. Please see the following sites about the train time table and how to buy the ticket. The way from the nearest station to the Symposium place is bit complicated. Mr. Yasuteru Imai of Kokusai Kogyo Ltd. has kindly prepared very convenient maps around the Symposium place. When you are coming to the Symposium for the first time, do not forget to print the maps and bring them with you. You will not be lost. Map to the Symposium Place from Yoyogi Uehara Station & Komaba Todaimae Station NEW! Map inside the Komaba Research Campus NEW! Those who are staying at the Komaba Faculty House, the following map is convenient. Map from Komaba Todaimae Station to Komaba Faculty House NEW!